Starting Monday, Minnesota residents can apply for an enhanced driver's license or identification card that will allow them to re-enter the United States from Canada, Bermuda, Mexico and the Caribbean without needing a passport. Applications for the licenses and identification cards that provide proof of identity and U.S. citizenship are available at 14 Department of Motor Vehicle offices throughout Minnesota. In the metro area, they include Anoka, Arden Hills, Eagan, Hastings, Plymouth and St. Paul. Minnesota becomes the fifth state in the country to issue the cards, which are federally-approved border crossing documents as spelled out in the Department of Homeland Security's Western Hemisphere Travel Initiative. The cards are equipped with Radio Frequency Identification technology, which allow border agents at land and sea entry points to scan the cards and verify a traveler's identity. The cards do not hold personal information, but send a signal to a secure system allowing agents to pull up one's biographic and biometric data. Applicants must be a U.S. citizen, a Minnesota resident who is 16 or older and must have a driving record that allow them to legally operate a motor vehicle. A Social Security number and proof of residency must be presented at the time of application. The cost is $15 in addition to the regular license fee for renewing or replacing a license or making application for a first-time license, permit or identification card. Applications will take two to four weeks to process, said Stephanie Kaufenberg, a Department of Public Safety spokeswoman. 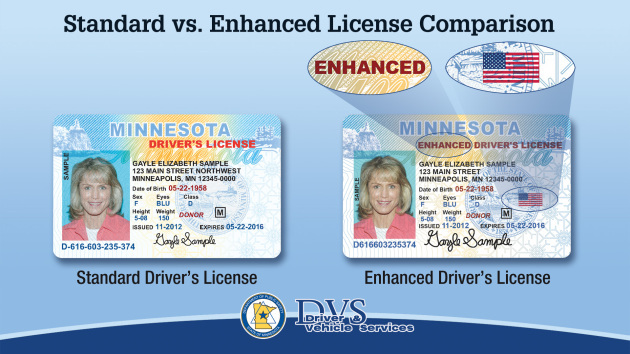 Other states that issue enhanced licenses and ID cards are New York, Vermont, Michigan and Washington.